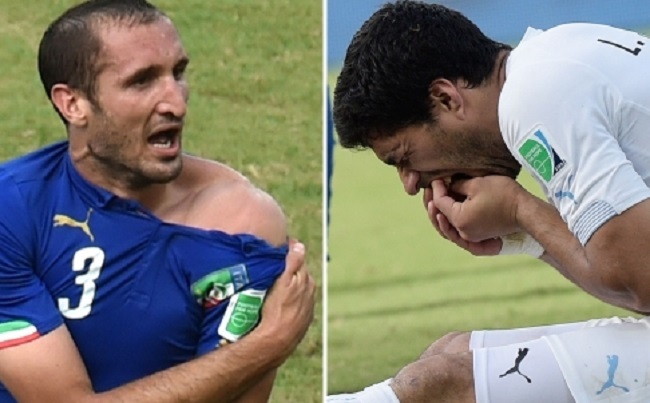 Brazil – Luis Suarez can learn to stop biting opponents but it will not be a quick or easy process, senior psychologists have said after the Uruguay striker bit Italy defender Giorgio Chiellini on the shoulder at the World Cup. Suarez, twice previously banned for biting, is under investigation by FIFA for the incident late in the Group D clash on Tuesday and faces another lengthy suspension. “From what I’ve seen in the video footage, Suarez took out his frustration and anger on Chiellini from blocking his access to the ball by reactively and impulsively biting him,” Eva Kimonis, senior lecturer at the School of Psychology at the University of New South Wales in Australia, told Reuters via email. Aggressive behaviour like biting and hitting may be reactive in response to a real or perceived threat. Among the research areas covered by Dr. Kimonis at the Australian university are aggressive and anti-social behavior and violent conduct. Liverpool forward Suarez was served a 10-game suspension last year after biting Chelsea’s Branislav Ivanovic in a Premier League match and spent seven games on the sidelines in 2010 for biting PSV Eindhoven’s Otman Bakkal while playing for Ajax Amsterdam. Kimonis believes that Suarez may have been acting out of frustration when he bit Chiellini, or simply trying to gain the upper hand as Uruguay battled for a place in the knockout stages of the tournament. “Aggressive behaviour like biting and hitting may be reactive in response to a real or perceived threat, or proactive to achieve some sort of instrumental gain, such as dominance or possessions,” she said. “In the case of reactively aggressive acts, the action is typically preceded by some sort of stressor that leads to anger and frustration, causing the person to lash out against the source of that threat. Clinical psychologist Dr. Corinne Reid from the School of Psychology and Exercise Science at Murdoch University in Western Australia, told Reuters there may be a team dimension to the striker’s actions that would need examination. “It would be important to check whether he thinks his behaviour is justified or acceptable,” Reid said in an email. Professor Reid said that while she agreed stress would be a factor in the Suarez case, it was by no means the only factor. “All elite athletes have to deal with exceptional stress. All have a stress signature, not all – in fact very, very few – bite. “It is also interesting to note how athletes react after a violent incident or stress reaction. Some athletes are instantly remorseful, embarrassed and ashamed of what they have done.